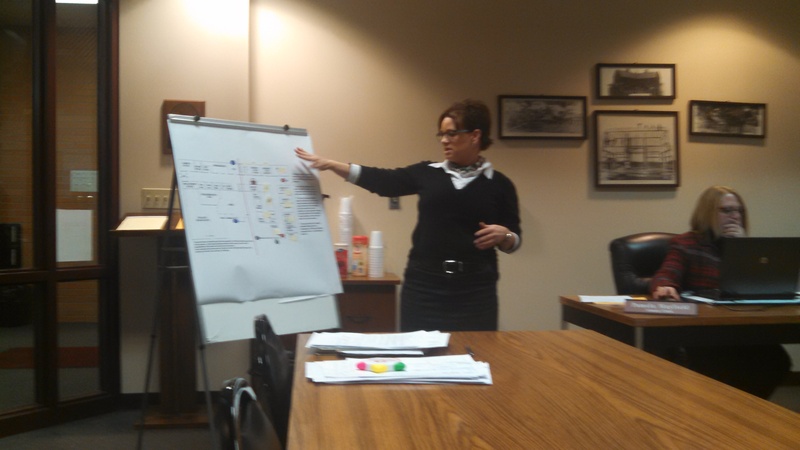 Lori Ware presenting the energy survey results and what steps should be taken next to help conserve energy at the county buildings at the Board of Commissioners meeting, January 21, 2015. After saving $700 in the month of December, by having Mark Fitzpatrick, who was put on as the part time maintenance worker for the county buildings back in November, turn the county building’s heating units up and down by hand every morning and night. The $700 saved was just in gas costs alone, Fitzpatrick said, they haven’t factored in the savings in electricity yet. With the savings in just one month being seen, Fitzpatrick and Lori Ware brought forward their proposal for what updates need to be done to the county buildings first to save even more money. Ware first updated the new commissioners on the survey that she, Fitzpatrick and Tracy Byard completed and presented at the November meeting. At the top of the list was still the replacement of the nine 25‑30 year old units. Ware said that these nine units have outlived their 15 year expectancy rate, and are no longer efficient. 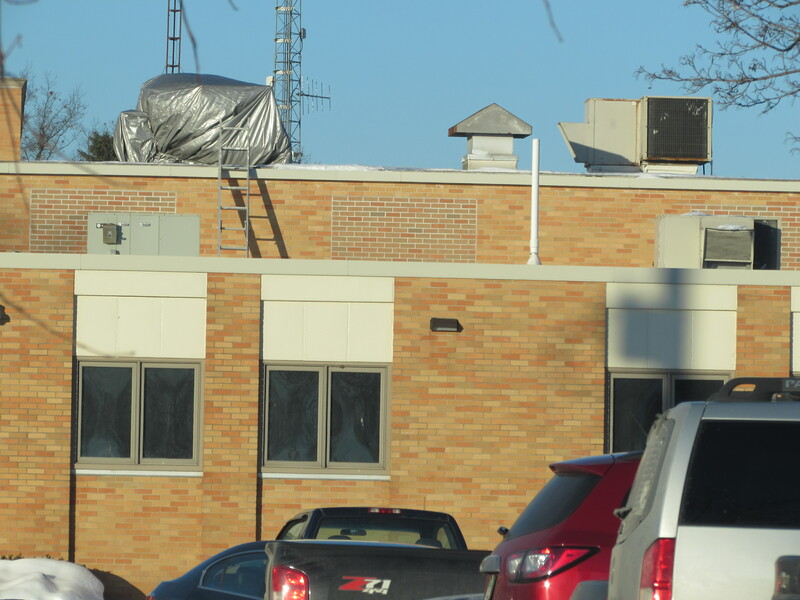 Unit above the judge’s chambers wrapped in a tarp put on by Fitzpatrick. By simply adding the tarp, the rooms automatically raised 5 degrees. As an antidote to explain how bad the units are, Fitzpatrick found that the unit above the judge’s chambers, juror rooms was leaking the hot air out of the building so badly, due to rusted pans and other issues, that after Fitzpatrick wrapped the unit up tight with a tarp, the rooms jumped up five degrees right away (see photo on the right). Next was the need to have a way to control the units internally. With Honeywell having control over the old units, and leaving, there is no way for the county to effectively control the intake and outtake of the units currently. So next on the list of top priorities was for the county to purchase a control system. This control system software would make a few county workers capable of adjusting the temperature of any room in any of the county’s buildings from their computer or mobile device. If there is a unit that goes down or has a malfunction, this system can also update those who have control to the issue straight to any device they have installed the system onto. While doing their survey, Ware and Fitzpatrick discovered an old mechanical closet of sorts in the ceiling on the court house side of the county building that use to house an air handling unit that has since been removed. Ware and Fitzpatrick communicated with some professionals about how many units could be eliminated from the court houses’ roof if a new air handling unit was brought in and based off the response, they estimated, by tonnage, that they could eliminate four and possibly up to six air conditioning units on the roof if the county purchased a new air handling system. 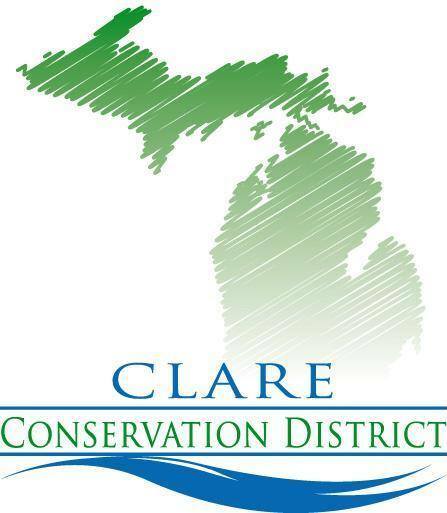 Ware informed the commissioners that the Clare County treasurer, Jenny Beemer‑Fritzinger, had offered to loan the county the money needed for these projects out of a fund. The estimate for a return on investment for these changes, Ware said, would be only a year and a half just for replacing the lights. With this project, Ware informed the commissioners that they will have the possibilities available for rebates from Consumers and DTE, up to $50,000 and a $14,000 to $15,000 for the lighting alone. After a break for lunch the commissioners continued the meeting and Ware had the floor again to see if the commissioners were on board with the project. It was voted to move forward with the project at the requested $250,000. Byard said that the county will have to do some adjustments to find where the county’s at and what funds to take the money from. During the months of September and October the Clare County Conservations District sent out it’s Gypsy Moth crews to all 16 townships in Clare County to count the number of Gypsy Moth egg masses present in the county. Winterfield had 83 spot checks with zero new and four old masses found. Summerfield had 59 spot checks with zero new and three old masses found. Frost had 134 spot checks with 18 new and 25 old masses found. Franklin had 130 spot checks with 24 new and 25 old masses found. Redding had 94 spot checks with zero new and six old masses found. Greenwood had 118 spot checks with 29 new and 19 old masses found. Hayes had 96 spot checks and was the only township to have zero new or old masses found. Hamilton had 81 spot checks with 10 new and zero old masses found. Freeman had 169 spot checks with 14 new masses and one old mass found. Hatton had 55 spot checks with 13 new and six old masses found. Lincoln had 229 spot checks with five new and four old masses found. Surrey had 225 spot checks with 20 new and zero old masses found. Garfield had 106 spot checks with two new and eight old masses found. Arthur had 69 spot checks with three new and zero old masses found. Grant had 135 spot checks with eight new and zero old masses found. And lastly, Sheridan had 55 spot checks with six new and zero old masses found. At the January 21 Clare County Board of Commissioner’s meeting Conservation District (CD) Administrator, and Gypsy Moth Coordinator, Holly Keenan, presented these findings to the commissioners and also informed them 2013/2014’s harsh winter could have been a factor in the survival rate of the Gypsy Moths and the number of egg masses located by the survey. She also believes that Frost and Franklin Township’s will be the ones that the CD needs to keep an eye on since Roscommon County, which borders both townships, no longer has a Gypsy Moth suppression program. Low numbers of egg masses were found in townships with no canopy, mostly farmland. She also wanted to inform the commissioners and community members that they found a lot of masses on outbuildings, campers, trailers and tree species other than oaks. She advised locals to check their campers and trailers for Gypsy Moth egg masses before moving them to help prevent the spread of the moth. Clare County hasn’t been sprayed for Gypsy Moths since the spring of 2012 and Keenan says that since the survey did not show the typically needed 300 masses/acre, that they will not be spraying again this year. The CD will be posting and publishing information on Gypsy Moths, how to spot their masses and how to get rid of them to help inform the public. If you have any questions about Gypsy Moths, you can contact the Conservation District Monday through Friday from 8 a.m. until 4:30 p.m. by calling (989) 539‑6401 or stopping into their office in the basement of the Clare County Court House. The first order of business at the January meeting of the Clare County Board of Commissioners was to elect the new Chairman and Vice Chairman. Commissioner Karen Lipovsky made a motion to vote by a raise of hands and was seconded. Lipovsky then voted to elect Commissioner Jack Kleinhardt as the new Chair and was seconded by Commissioner Jim Gelios. County Clerk Pam Mayfield then put it to the vote and all hands were raised, no opposition. Next up was the election of the Vice Chair. 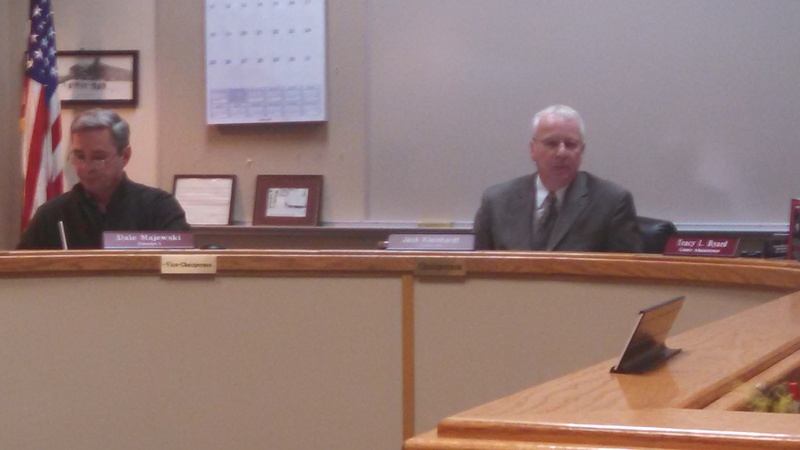 Commissioner Leonard Strouse took no time nominating Commissioner Dale Majewski into the Vice Chair position. He was seconded by Lipovsky and through the vote, no one opposed. They were voted into a one year term. New to the board were Commissioner’s Donald David who will cover District 5 and Samantha Pitchford who will cover District 2. Later in the meeting the commissioners made it to Finance and Administration Committee where they had to approve the Commissioner Meeting Dates. The original motion was to approve the pre‑set 2015 Board of Commissioners meeting dates which was for meetings once a month. Commissioner David voiced his opinion and said that he thinks that going to two meetings per month would be a better idea than just once a month. Having the meetings twice per month would give the Commissioners more time to learn about issues, think them over and come back in two weeks to make a decision instead of having to wait another month. Commissioners Lipovsky and Majewski both countered David’s argument, saying that they believed that having the meetings once a month was working. Majewski argued that the commissioner’s job is to come into a meeting with the facts and info of the issues they are deciding on beforehand. Commissioner Gelios, agreeing with David, said that this very meeting was an example of how two meetings per month would be helpful. A presentation about the building updates and court house security was brought up to the commissioners and they needed time to discuss, absorb and decide. Gelios agreed that if they had two meetings per month that this could have been presented at the first meeting, the commissioners would have two weeks to mull it over, then a valid decision could be made at the second meeting. This would make it so that the commissioners no longer needed to make decisions “on the fly,” and the department heads wouldn’t have to wait an entire month to move forward with plans, repairs or addressing other issues. Lori Ware asked to chime in and said that as a department head, that she has concerns with the meetings being only once per month. “We do business at the speed of business,” Ware said. Meaning that with the meetings only once per month, if she needs something approved over $3,000 she has to wait for at least a month for the commissioners to approve it and that sets her and her offices back. Kleinhardt asked for the Sheriff and Undersheriff to give their stance on the issue. Sheriff John Wilson said that a meeting once per month slows the department way down. Undersheriff Dwayne Meidzianowski agreed with the Sheriff and said that sometimes the things they need board approval from are timely. He suggested that if the board not approve to go to two meetings per month that they up the amount that the Administrator can approve from $3,000 to $6,000. Finally, after much discussion, David made the motion to go to two meetings per month, the first and third Wednesday of each month, which was seconded by Gelios. A role call was taken and there were none apposed and the motion passed. The next Board of Commissioners meeting will be February 4 at 9 a.m.
Meth Lab Bust On Finley Lake Rd. In Lincoln Twp. The two individuals arrested at the scene of a meth lab on Finley Lake Rd. have been formally charged in Clare County’s court. 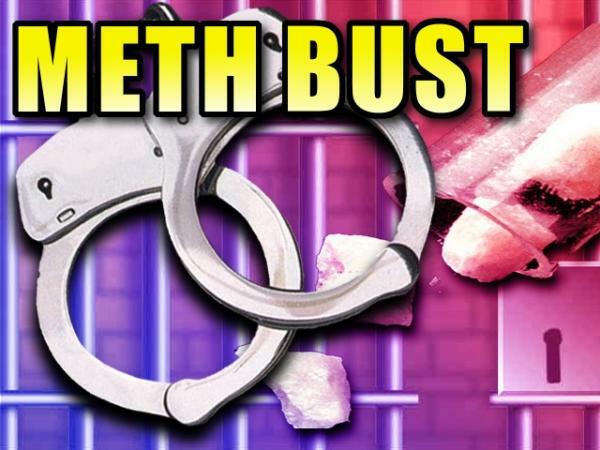 Heather Pohl, 24, and Robert Lavoie, 25, were arrested after BAYANET issued a search warrant for their home and discovered small amounts of methamphetamine and items used to make the drug. Pohl is facing five drug related charges and Lavoie faces three. Both are being housed at the Clare County Jail. Clare County – The Bay Area Narcotics Enforcement Team (BAYANET) received information that individuals were manufacturing and distributing Methamphetamine in the Clare County area. After a thorough investigation a Search Warrant was secured for an address on S. Finley Lake Ave. in Lincoln Twp. Two (2) suspects; listed below, were arrested after leaving the residence. Both suspects reside in the Clare County area. Evidence of manufacturing Methamphetamine was found in the residence and a small amount of Methamphetamine was seized from the residence. Numerous Felony charges are pending with the Clare County Prosecutor’s office. BAYANET detectives were assisted in this investigation by the Clare County Sheriff’s Department & Michigan State Police – Mt. Pleasant Post. The Mt. Pleasant City Police Department, Central Michigan University Police Department, Clare County Sheriff’s Department and the Saginaw Chippewa Tribal Police Department support BAYANET by assigning Detectives to the North Team. BAYANET consists of three street level multijurisdictional drug enforcement teams. The jurisdictions serviced by BAYANET include Bay, Clare, Gladwin, Isabella, Midland, and Saginaw Counties. Participating agencies are: Bay County, Clare County, and Midland County Sheriff’s Departments, Midland City Police Dept., Saginaw City Police Dept., Mt. Pleasant City Police Department, Saginaw Township Police Dept., Saginaw Chippewa Tribal Police Dept., Central Michigan University Police Department and the Michigan State Police. 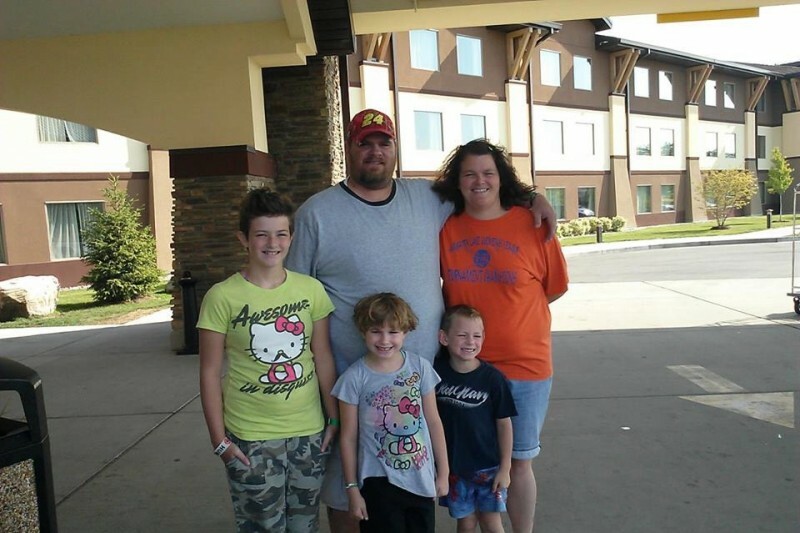 After losing their home to a fire on January 21, the Mashue family is in need of the communities help. Parents Angel and Mike Mashue and their three children have been displaced from their home on Pine Street and lost everything. Luckily no one was home. Angel has been a long time employee of the Budd Lake Bar in Harrison and has also helped out at the sister establishment, The Limberlost in Houghton Lake. 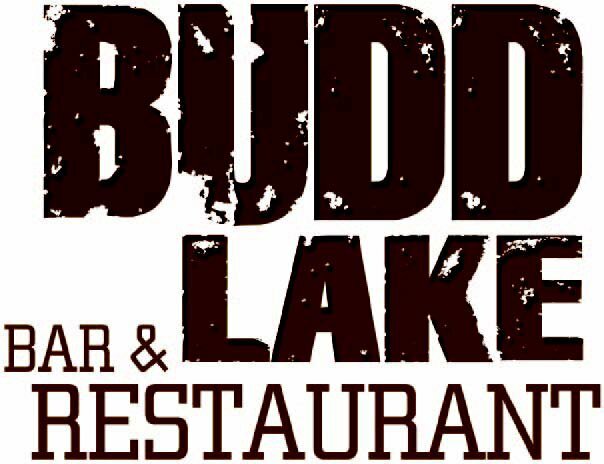 On Wednesday, January 28, the Budd Lake Bar will be hosting a benefit spaghetti dinner, silent auction and bake sale to help out the Mashue family from 5 to 8 p.m. The family is in need of all items: Daughters wear sizes 8-9 Jr. jeans, medium shirts, 10-12 pants, 10-12 shirts, shoe sizes 9 adult and 5 kids. Son wears 7-8 slim jeans, 7-8 shirts and size 2 shoes. Mom wears 2x shirts, 16 long jeans and 10 shoes. Dad wears 4x shirts, 52×32 pants and size 12 shoes. The family would appreciate any and all help that the community can give. Items for the family can be dropped off at either the Limberlost or the Budd Lake Bar. 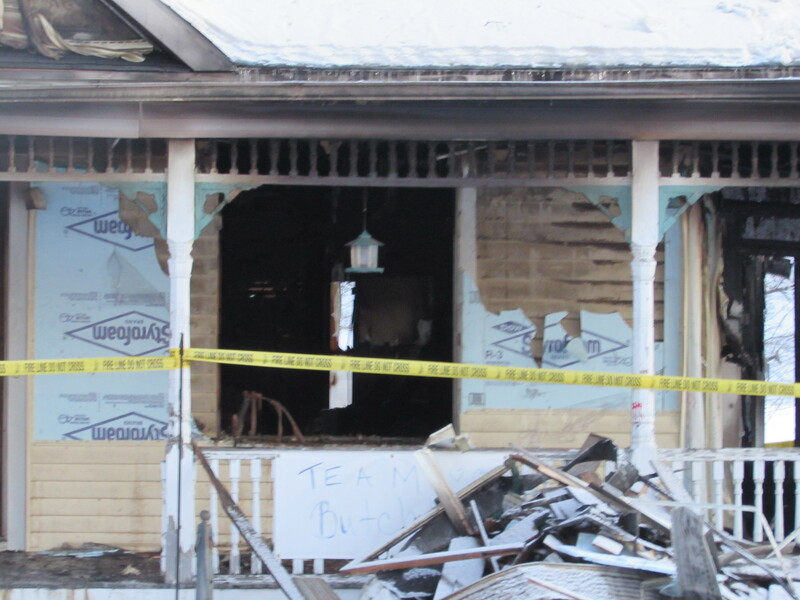 In the early afternoon a Harrison home on Pine Street, close to First Street, was destroyed by a fire of unknown origins Wednesday, January 21. Central Dispatch received a call after a passerby saw smoke emerging from the home. 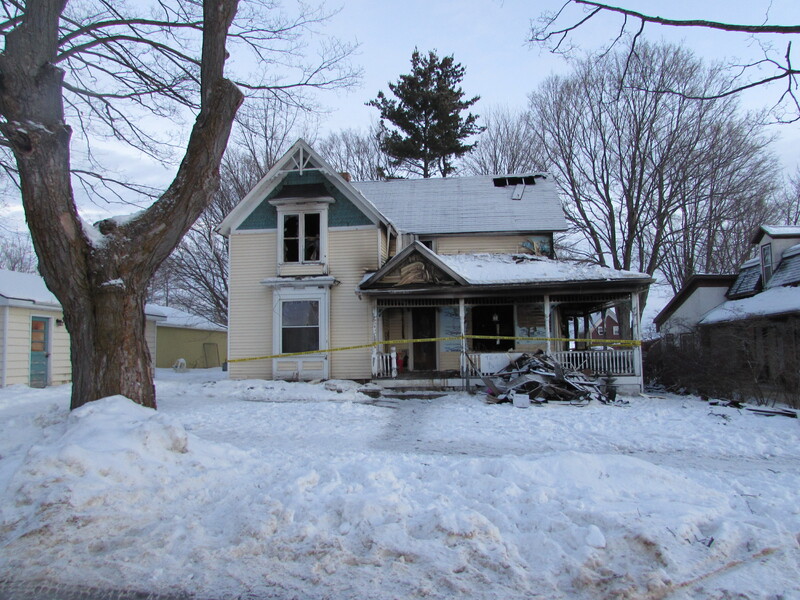 Clare, Harrison and Gladwin County fire departments worked hard to quickly extinguish the fire before it caused too much structural or external damage. 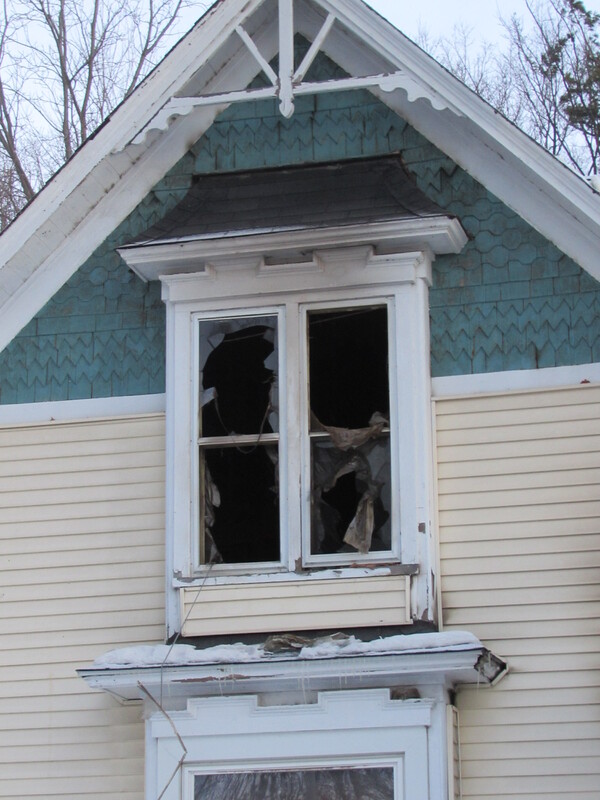 The house now stands empty with windows broken out from putting out the blaze. 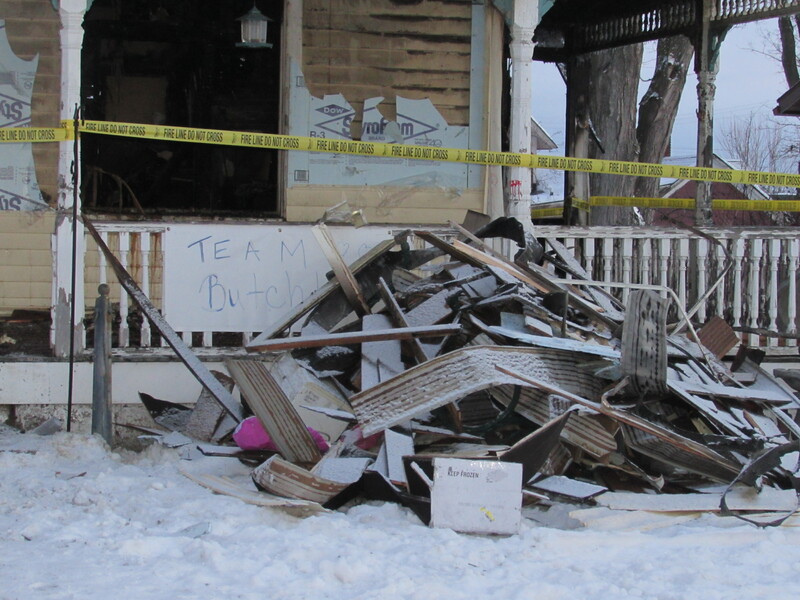 Piles of debris sits out in front of the gutted house and a single bird feeder still hangs off of the porch. Some of the siding is warped and melted from the heat of the blaze and “Fire Line Do Not Cross” tape still wraps the house. The fire is still under investigation and the cause of the blaze is still unknown at this time.